paLaura Kremmel is beginning the last year of her PhD at Lehigh University, completing a dissertation that considers the ways in which Romantic-era Gothic literature picks up the theories of late eighteenth century medicine. She has published on both the Romantic and the Contemporary Gothic and is an active member of the International Gothic Association. She also runs the Gothic Reading Group at Lehigh and has been a long-time blogger for http://www.nassrgrads.com/. nineteenth century Gothic chapbooks and bluebooks: the centrality of the plot, its abrupt action, the power of speech, the unreliability of death, and the consistency of closure. In this post, I will be looking closely at one text in particular: Midnight Horrors, or The Bandit’s Daughter: An Original Romance, listed in the British Library catalogue with an anonymous author and a speculated publication date of 1810. I choose this text because it serves as an accurate example of what these kinds of texts are like in both style and content but also because it includes aspects that push the boundaries of what this form can do. The Baron di Montalban has been injured in battle, and the Baronness is called into a forest of many horrors to assist him. She is attacked by banditti, wounded, and taken to their cavern lair, where her wound is “slightly attended to” once it is determined she will live. In captivity, she encounters the bandit’s daughter, Eglantine, who doesn’t realize that the company she keeps is disreputable and that her father is a bandit. All she knows is that she has been promised in marriage to a man she doesn’t like, so when the Baroness introduces her to the idea of escape through the passages, she is easily convinced. The soon become lost in the darkness but are rescued by a mysterious source: “A blue vapour issuing from the extremity, gradually diffused a stronger light on the object that the veiling curtain had concealed, and revealed a narrow and deep chasm, in which were deposited, in rude disorder, a number of coffins. A ladder, placed nearly in perpendicular direction, led into the interior of the dreary sepulchre.” This blue light then becomes a gliding flame that shows them the tomb-like cavern and lights their way. They descend the ladder and make their way through passages lined with coffins, often impeded by the bloody bones of previous prisoners. As they near the end and catch sight of the unclosed grate through which they will escape, they must climb over decayed coffins. Reminiscent of a modern horror film spoof, Eglantine falls through the lid of one of the coffins and becomes entangled with one of the corpses, causing yet more delay in their proceedings. The blue flame eventually leads them out into the forest and to a dungeon in Surrey, where they discover the remains of the Baron covered in a crimson cloak, thickening vapor, and blue light. “The bleeding shade of Montalban’s cheiftain appeared to the fixed gaze of the agonized Gertrude [Lady di Montalban]. Three dismal groans re-echoed through the lofty dungeons! and the pale spirit, pointing to its earthly form, that laid a murdered corpse upon the cold stone before it, gradually vanished from their sight!” This sudden appearance of her husband agitates the Baroness such that she begins to experience symptoms of fatality. She calls Eglantine to her side and tells her to flee so that she might not suffer the shock of witnessing her death. Eglantine panics, runs to get help, finds a lamp and returns to find that, in dragging herself next to her husband’s body, the Baroness’s unhealed wound had reopened, and she more speedily rushed towards death, dying just as Eglantine faints. Speeding things along: Eglantine is carried out of the dungeon by two strangers, who turn out to be the Adelbert and his uncle, Baron di Rosini, who (as is discovered through a miniature of her mother she wore) turns out to be the father of her mother, Constance, who had been tricked into having the bandit’s child, thinking that he, whose name is Roderigo we now learn, loved her. As soon as Eglantine was born, he kidnapped his child, and Constance became feverish and mad, eventually committing suicide by stabbing herself in the heart. The Baron di Rosini now plans to attack the bandit, much to the conflicted fears of daughter and granddaughter Eglantine. She begins meeting her father nightly in a secret subterraneous passage to bring him supplies, but one night she is followed by the Baron, who accuses her of having a second lover (her first being Adelbert, to whom she has pledged herself). He eventually catches on that it is her father she is visiting, not a lover, and uses this knowledge to capture him. Rather than put him to death immediately, Roderigo is sentenced to fight the Baron di Rosini: if the bandit wins, he will be sent to “those who like to torture.” He accuses his daughter of assisting in his capture and, when he grasps hold of her in the dungeon, she faints, and he is about to stab her when the tomb of her he had deserted and betrayed, slowly unclosed, and the pale shade of the injured Constance, with solemn movement, rose from the sacred receptacle! the vital stream seemed still freshly to flow from the self-inflicted wound; slowly she glided from the sepulchre, and approaching the receding bandit, with one hand she pointed to the still senseless Eglantine, and with the other to the glittering steel he had continued to hold.” Confronted by such a spectre, he is overcome with fear and guilt and falls to the ground. As he does, his dagger pierces his side and, as he is dying, guards burst into the dungeon and discover Eglantine still unconscious but very much alive. The ghost, of course, has vanished. These brief paragraphs condense about forty-five pages of the original, pages being somewhat smaller than a modern trade paperback. As you can see, actions occur quickly and almost immediately: little introduction is given to the characters before the Baroness finds herself called to action and in the woods pursued by banditti. Events happen one after another, as I have tried to demonstrate by packing multiple events into single sentences. The few places where I have given direct quotes are typical in their excessive use of exclamation points, often used to break up sentences and add drama to already dramatic language. In fact, this is one of the more literary examples of a Gothic chapbook, obvious effort taken to slow down and insert instances of atmospheric horror as well as horror produced through plot twists and turns. Where human relationships are required to move the action along, however, the text has no space to slow down and develop them. Rather, quick conversations expedite the establishment of trust or distrust and hastily convince characters to make decisions and quick alliances, even with characters who had been strangers just a paragraph earlier. Such is the case with the bond between Lady di Montalban and Eglantine, one that trumps a lifetime of living with a father and his bandits. Roderigo not only takes a moment to survey his surroundings, adding to the Gothic atmosphere of the text, but he actually considers what he’s about to do, who he’s about to do it to, and the meaning of life: big questions for such a tiny book. That he speaks aloud to himself and laughs—a laugh that can only be interpreted as a nervous attempt to console himself and ridicule his hesitation—shows a rare moment of inner conflict, rare particularly for a villain. This is the first bit of real character development we get for Roderigo, but it is too late and too little to endear him to us. His reflection, deemed a moment of weakness by the tyranny of the plot, is directly punished by the intrusion of the ghost, who realigns the momentum of the action disrupted by Roderigo’s indecision, ending the text with a typical climax consisting of the supernatural, death, and justice. We end, as predicted, with closure: the bad guys are punished and the innocent victims saved. Yet, I would argue that Roderigo’s moment of existential meditation adds to this closure rather than detracts from it. Roderigo is, we mustn’t forget, Eglantine’s father, who has cared for her for most of her life, however oppressive that care may have been. His reflection, though instigated by the general creepiness of his setting, turns quickly to his child, expressing concern for any pain she might feel and a desire to cease any ill opinion she may have of him. His jealousy of di Rosini for the pleasure of caring for Eglantine exhibits some semblance of affection for a daughter he believes he has lost to his enemy. Thus, his moments of reflection serve to preserve good will towards the general station of fatherhood, one that will, of course, always be trumped by motherhood. Roderigo’s moment of reflection also ushers in the opportunity for Constantine to both enact revenge and save her daughter in one fell swoop: Gothic closure at its finest. … at length, a faint respiration heaved the chilled bosom; the almost motionless pulses gradually regained their vibration; and a low imperfect sound murmured on the colourless lips…. The Baroness groaned heavily, she would have spoken but faint from the exertion she had already made, she was unequal to the effort. Eglantine, terrified by the deathlike coldness, that stole over the form of the Lady di Montalban, and the dying languor by which she appeared oppressed, arouse, and actuated by the impulse, ran shrieking through the dungeon…. The Lady di Montalban, during her absence, had raised herself from the ground, and by a last effort of strength, had thrown herself on the low bier by the side of the breathless body of their murdered Lord. The bandage that bound her side had fallen in the attempt, and the stream of life was fast flowing from the re-opened wound. The cold dew of mortality stood on her livid forehead, and every feature bore the ghostly hue of death… a short convulsion seized her struggling form, her heavy eye-lids closed, and with a long, and awful groan, the released spirit burst from its mortal frame. I find this death scene curious, not just for its length, but because, though this character is central to the beginning of the story, her only purpose in the plot at large is to get Eglantine out of the banditti lair she has known as home, which then facilitates her reunion with her grandfather and knowledge of her mother. The Baroness is not a family member or a close guardian, nor does her or her husband’s story come back into play later. In fact, her husband’s death is never avenged. His ghost does nothing more than lead them through the passages—the blue light a traditional indicator of the supernatural—and instigate his wife’s own death, unlike Constance’s ghost, which intercedes to save life. The story of the Montalbans ends with this dramatic and seemingly purpose-less death scene. I don’t have answers for a lot of the questions I have about this instance, but it does fit within the chapbook tradition in terms of the drama and suspense it creates. The way in which it creates these effects is much more typical of a Gothic novel than a chapbook, however, making me suspect that its roots lie buried in a much more substantial text. The scene of the ghost at the end is reminiscent of Matthew Lewis’s The Castle Spectre, but I am unsure from what text Lady di Montalban’s death may be drawn—one of the more obscure titles amongst Jane Austen’s “Horrid Novels” perhaps, or even a popular text now lost to us, as I suspect many chapbooks represent. What I will say is that the scene provides an unusual amount of detail and realism to a form often noted for its required suspension of disbelief. The detailed symptoms suffered by the body do not slow down the plot in the same way reflection does (for the few moments it exists), but rather sustains its pace through a magnified narration of the plot of the body. While exhibiting many of the core characteristics of the chapbook, Midnight Horrors finds ways to incorporate unusual details that support rather than hinder the important movement of the typical Gothic plot. 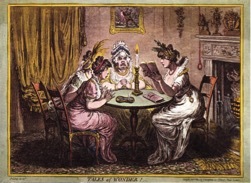 Published in New York in 1823, as included in a 2008 reprint of the anthology, The Spectre Bride and Other Horrors, through Wildside Press. Anonymous, Midnight Horrors, or The Bandit’s Daughter (London: Dean & Munday, 1810), p. 9. It is not unusual for characters to have several different names by which they are referred to in the text, exhibiting multiple titles and stages in the development of their social status… sometimes much to the (modern) reader’s confusion, I must confess.